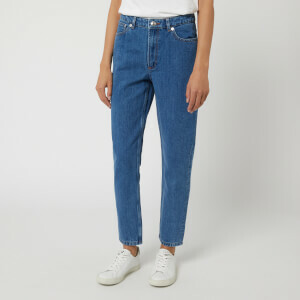 Women’s high-rise blue jeans with a cropped and slightly flared leg from Austrian designer, Helmut Lang. 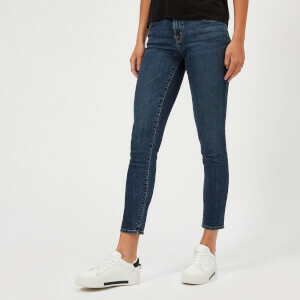 Crafted from pure cotton and cut slim through the thigh, the five pocket jeans have a faded wash with silver-tone, logo-engraved rivets and darker, frayed hems. 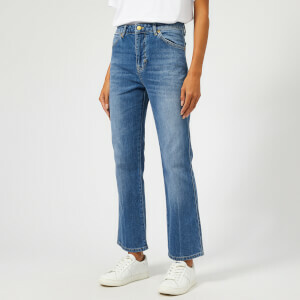 Fastened with a button fly, the jeans are finished with a V-shaped yoke, belt loops and contrasting yellow topstitching. Shell: 100% Cotton. Lining: 65% Polyester, 35% Cotton.